﻿ Irish Film Institute -WIN A PRIZE TO CELEBRATE THE YOUNG AND PRODIGIOUS T.S. 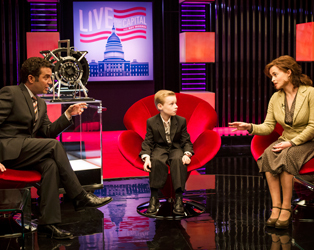 SPIVET (3D) AT THE IFI! WIN A PRIZE TO CELEBRATE THE YOUNG AND PRODIGIOUS T.S. SPIVET (3D) AT THE IFI! To celebrate the release of the film The Young and Prodigious T.S. Spivet (3D) directed by Jean-Pierre Jeunet, opening EXCLUSIVELY at the IFI on Friday, June 13th, we have three fantastic prize bundles to give away! Each bundle includes: Jeunet’s previous works, Amélie and Micmacs on DVD, Reif Larsen’s book on which the film is based, a T.S. Spivet bookmark and a poster! T.S. Spivet is a clever, precocious and intuitive 10-year-old living on the family’s ranch in Montana, with an imagination and intelligence that give him the notion to escape his meagre circumstances. His parents appear mismatched; dad is a cowboy throwback, while mom is a distracted entomologist. His timid brother and diva of a sister give him further cause for grief. On taking a call from the Smithsonian, who are under the impression he is a grown-up inventor of a perpetual motion machine, he leaves home for Washington, intent on accepting a prize being offered to him. His decision sets him on course for a brilliant adventure. Which of these films was directed by Jean-Pierre Jeunet?